Theophano Mitsa did everything right to prepare herself for a career in her native Greece. She scored high on college entrance exams. She graduated near the top of her class in electrical engineering at Aristotle University of Thessaloniki. But in Greece in the 1980s, that was not enough. Theo, a single child whose parents were of modest means, "had no connections in any political party, which was the surest way of getting a job in Greece then. No close relative in a bank, utility company, or government office who would put in a good word for me. To put it simply, I was toast." So she took a six-hour bus ride to Athens with her mother to apply for a Fulbright scholarship. She was accepted to one of her top choices: the University of Rochester, primarily because of its imaging processing program. That's how Theo Mitsa came to the River Campus as a PhD student. Her involvement in the invention of Blue Noise Mask here is one of the reasons she is this year's winner of the Hajim School's Distinguished Alumni Award. Initially, Mitsa studied codes and signal processing in what was then the Department of Electrical Engineering. She knew that would be excellent preparation for work in the "Star Wars" missile defense program promoted by the Reagan Administration. However, after a "chance discussion with friends about job prospects," Mitsa realized her status as a foreign national would preclude her from working in government labs on that project. She talked to professor Kevin Parker, liked what he was doing with medical imaging, and asked to work with him. Parker says he "knew from the start" that Mitsa "was a special person capable of doing notable work." Parker was grappling with the misleading patterns that often appeared when halftone medical images were printed from the laser and desktop inkjet printers then available. The printers, still in their infancy, were only capable of 100 to 150 dots per inch. Initially, Mitsa recalls, she and Parker planned only to determine the best existing halftoning techniques for medical images. But eventually they decided to create their own halftoning algorithm. One day, Mitsa recalls, "Kevin came into my office and told me about an idea he had the night before. He started drawing on the board, and that became the main body of the Blue Noise Mask." For her thesis, Mitsa built the Blue Noise Mask program on computer, and she also provided the mathematical proof that the algorithm would produce high-quality results. The coinvention of Blue Noise Mask with Parker was both a "direct blessing and an indirect blessing disguised as a curse," Mitsa says. It gave her a great sense of accomplishment; it also provided her with the financial wherewithal to endow a scholarship at the University and with the financial independence to pursue her interests "without worrying about budgets, deadlines, and grumbling bosses." It also seemed like a curse at times. During litigation over Blue Noise Mask patent rights, some big-name professors in her field were engaged as technical experts for the other side. "It was not a great environment for the publishing activities of a budding assistant professor," she says. 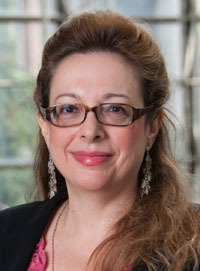 Mitsa switched the emphasis of her research to pattern recognition. The "curse" turned out to be a blessing in disguise. Mitsa collaborated with researchers at the University of Iowa on new techniques for the detection of emphysema and was awarded several patents in medical imaging and a prestigious Whitaker Foundation award. A negative turned out to be positive after all. "As I like to say, my friends and family taught me how to walk, but it was my enemies' kicks that made me fly. Be thankful for your friends but also for your enemies—they might just be your greatest benefactors." Now, Mitsa is an independent data mining/machine learning consultant with a focus on Big Data. She is also working on a book, contributes to analytical community blogs, and writes one of her own. "The University of Rochester gave me the best and most important educational experience in my life," she adds. "It was much more than a degree. It defined a lot of my fights, a lot of my successes, a lot of who I am today."